Flashpoint Gallery reliably gives me a good time. I’m always excited to go in, and I leave wanting to talk about what I’ve seen. Right now the exhibit shows works in concrete and string by Suzannah Vaughan. The show, Tracing Form, is sponsored by Solas Nua, the fabulous go-to (and only) organization in DC for contemporary Irish art. In the long rectangle of the gallery’s white walls, art fans clustered tightly around the artist, brushing their plastic cups of wine against each other, leaving the entire other end of the gallery vacant. Regarding personal space codes–in elevators, everyone naturally spaces themselves out, at gallery openings, we space ourselves in. Vaughan’s work rests on pedestals rising out of the floor. Before coming to DC, she researched the city’s architecture and created her pieces accordingly. The Metro system and the Hirshhorn feature prominently in her design. I was strangely flattered as a DC denizen. Oh, you were inspired by that little monument? Well, aren’t you sweet? 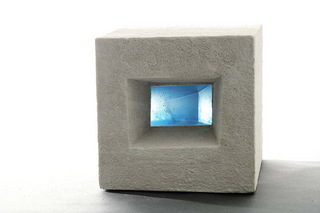 The sculptures are made with lightweight concrete, molded around a solid piece of glass, Vaughan’s main medium. Some have LEDs inside and some are lit by natural light, allowing the pieces to change throughout the day. They reminded me of Superman’s Fortress of Solitude, all hard lines and cold brightness. If you look inside, you can see the magically distorted reality of whatever is on the other side. The exhibit runs through February 12. Flashpoint is extremely Metro accessible at 9th and G Streets in Chinatown.